When asked to identify the key contributors to the success of their change initiatives, participants in the Best Practices in Change Management study placed active and visible executive sponsorship at the top of the list. Sponsorship has been number one on the list of top contributors in all of Prosci’s benchmarking reports since 1998. Though much has changed in the field of change management over the last two decades, the importance of the leader’s role in change has remained constant. When asked to identify the biggest obstacle to success, participants in the same Best Practices study identified a lack of effective change sponsorship from senior leaders as their primary obstacle to success. Sponsors were inactive or invisible, not at the right level, not aligning other leaders around the change, and wavering in their support. Ineffective sponsorship resulted in more resistance and slower progress toward realizing the organization’s desired results. Prosci’s research indicates that starting change management activities early in a project’s lifecycle has a significant positive impact on the outcomes of the project. However, only 40% of study participants were able to start change management work at project initiation. When asked what enabled this preferred approach, over half of respondents cited senior leadership involvement. Senior leaders with knowledge and experience in leading change insisted on change management inclusion from the start of the project. Employees have preferred senders of messages about change. Employees want to hear about the change from two people in the organization: the person they report to and a leader at the top. Not only are senior leaders impactful to the success of change initiatives at a macro level, they play a specific key role in supporting the application of change management and in communicating directly to employees about why a change is needed. 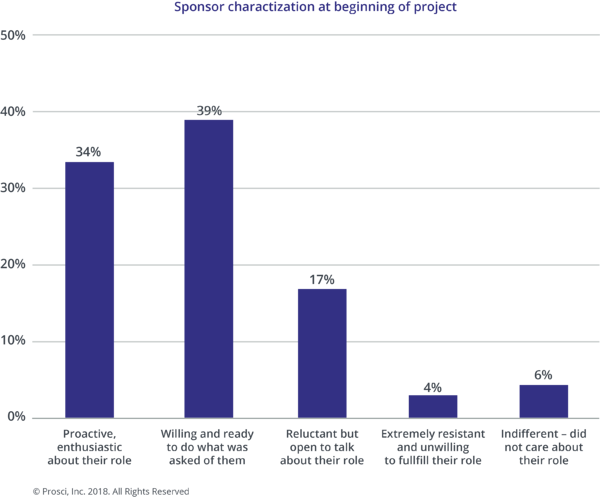 The role of active and visible participation for the primary sponsor was cited more frequently than any other sponsor activity. Study participants identified a list of activities that constituted active and visible sponsorship—from allocating the necessary funding to participating in change activities. Sponsors cannot disappear once they've attended the kickoff meeting for a project. Their sustained presence is necessary to build and maintain momentum for a change. Employees impacted by change want to hear why a change is important from a leader at the very top of their organization. Senior leaders are the preferred senders of messages about the business reasons for change, as well as the risks or costs of not changing. An effective sponsor legitimizes the need for change within the organization and sets the prioritization of change through direct engagement with impacted employees. Participants stated the need for the primary sponsor to take a lead role in building and maintaining a healthy coalition of leaders who support the change. The sponsor must mobilize other key business leaders and stakeholders so they can advocate for the change and legitimize it in their part of the organization. A healthy coalition of sponsors is especially important for changes that stretch across multiple functions within the organization. Though these three roles are critical to the success of any change effort, in reality, many executives and senior leaders are not fulfilling these roles effectively. 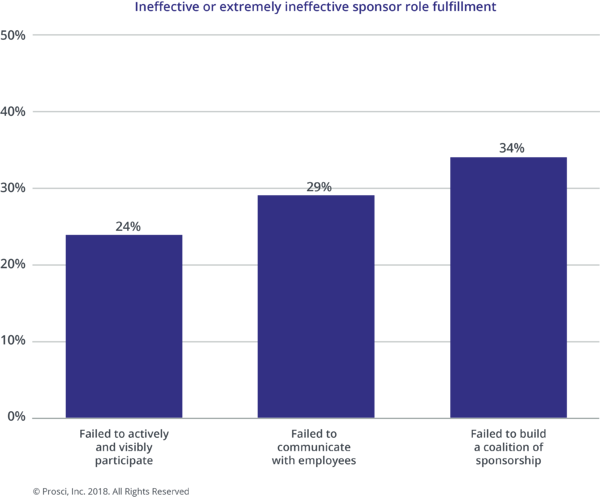 The figure below shows the percentage of participants who stated their sponsors were either extremely ineffective or ineffective at the three roles outlined above. The role that sponsors struggled with the most is building a coalition of sponsors. Participants in the latest research report described their sponsors at the beginning of the project. The data shows that most senior leaders were easy to engage in the role of sponsor. Over one-third were proactive and enthusiastic about sponsoring change and nearly 40% were ready to do what was asked. Only one-quarter of participants indicated some hesitation, resistance or indifference from their sponsor. Research participants said their executives and senior leaders were generally willing to be sponsors of change, yet many did not fully understand what that meant. The figure below shows how well leaders understood their role and responsibilities as change sponsors. 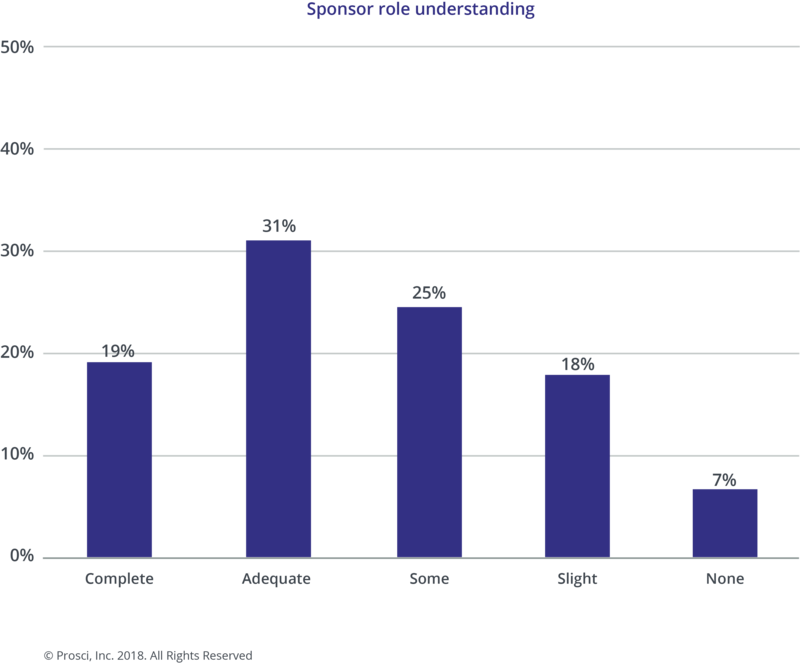 Some 50% of participants reported that their sponsors did not have an adequate understanding of the role of a sponsor. Change management practitioners can support sponsors by playing an enabling role for senior leaders. Executives and senior leaders benefit from support and encouragement around their sponsorship role. The change management specialist can enable leaders to be more effective sponsors of change by coaching and facilitating specific sponsorship activities and action steps. When change management teams support sponsors effectively, they become a vital partner to executives in the achievement of successful change outcomes. For each change project, a change practitioner should work together with their sponsor to outline and agree on the specific sponsorship activities needed for each audience at each phase of the project. 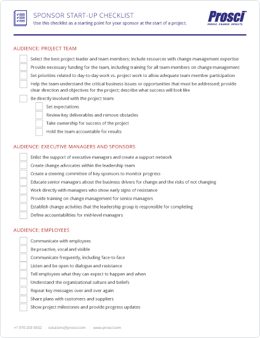 Use this checklist and template as a starting point for your sponsor at the start of a project.